MacAllister Machinery is a Sullair dealer for Indiana and Michigan offering a complete selection of air compressors that provide legendary reliability, durability and performance. Our inventory features compressors for all different industries and applications, including general construction and contracting, industrial, municipal and beyond. We’re proud to be a go-to source for best-in-class equipment solutions, including a variety of options for new, used and rental Sullair products. Sullair has been a leader in quality and innovation in compressed air equipment for over 50 years. When you buy a Sullair air compressor from us, you can rest assured you’re getting a premium product backed by exceptional customer service and support. As your local Sullair dealer, MacAllister Machinery offers a wide range of top-quality air compressors. New Sullair equipment is designed for easy use and maximum efficiency. From the latest technologies and safety enhancements to precision controls and rugged enclosures, there are many benefits to buying an air compressor manufactured by Sullair. 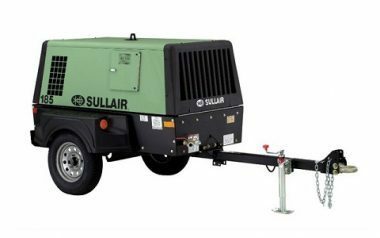 Portable Air Compressors: When on-the-job mobility is a top priority, Sullair portable air compressors get the job done right. We carry oil-flooded and oil-free models featuring a broad range of sizes, horsepower, air pressure and features. From the small and maneuverable single-wheeled 185 Tier 4 Final Portable Air Compressor to the ultra-heavy-duty Sullair Dual Performance Tier 3 Family, you’re sure to find a solution that fits your particular requirements. Stationary Air Compressors: We offer a full range of oil-flooded and oil-free stationary air compressors ranging from 5 to 10 horsepower and 100 to 150 PSI, up to 200 to 400 horsepower and 250 to 725 PSI. You’ll find rotary screw air compressors and free-scroll and centrifugal air compressor options. Stationary Sullair air compressors are easy to maintain and service and deliver best-in-class quiet operation for a safer work environment. Learn more about Sullair air compressors. When you’re looking for an air compressor for a day, a week, a month or longer, see the experts at MacAllister Rentals. Our flexible temporary equipment solutions help businesses of all different sizes and types expand their capabilities and lower their operating costs. We carry an array of options in portable compressors for rent, along with all the tools and accessories you require. We offer a variety of used air compressors for sale for an economical way to increase the capabilities of your fleet. All of our pre-owned products are tested for quality to ensure peak performance in the toughest conditions. Whether it’s an air compressor for a remote construction site, industrial facility, or any other environment, we’ll help you find the equipment you’re looking for at a competitive price. Get the high-quality air compressors you need to boost productivity and grow your business. 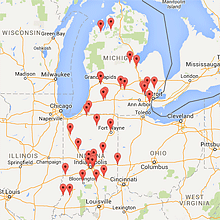 Contact us online, on the phone, or in-person at the location near you for more information.